Old friends reconnected, and new friends were made at Alumni Weekend 2010. Alumni displayed their films and art and gave talks on topics such as “Unintelligent Design,” the future of education, folk songs as social history, and viruses and cancer. Music flowed all over campus, including the folk music of Merry Lyin’; the Class of 1990’s “Quaker Cabaret”; Joe Raciti and Andrew Rose Gregory ’04 with piano and vocals at the Class of 2005 party; and a performance by Nathan and the Narwhals. More than 30 intrepid alumni joined Roger Latham ’83 for a guided tour of the Crum Woods. On Friday evening, alumni gathered for an outdoor cocktail party and dinner, before making their way to one of three faculty lectures. The lectures were given by Eric Jensen, associate professor of astronomy; Patricia Reilly, associate professor of art history; and George Lakey, Eugene M. Lang Visiting Professor for Issues of Social Change 2006–2009. 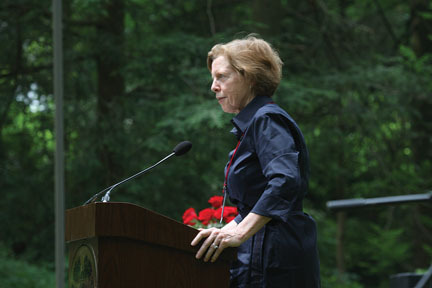 Ann Brownell Sloane ’60, the 2010 Collection speaker. Throughout the afternoon on Saturday, there were events to suit every taste, including an open microphone event in the amphitheater, a variety of department and affinity group receptions, an art exhibit, and a kids’ carnival on the lawn. A performance of Mozart’s Requiem—a perennial favorite—was led by Associate Professor of Music John Alston. Reunion class dinners offered alumni the chance to re-engage with old friends and make new ones. Alumni Weekend would not be possible without the dedicated efforts of class volunteers, and we thank all of them for their hard work. We also thank the students, staff, and faculty who make this event so special for alumni and their families. 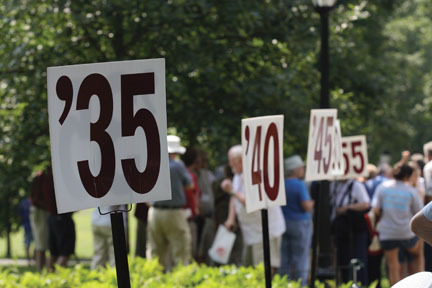 Mark your calendars now for Alumni Weekend 2011, scheduled for June 3 to 5. We hope to see you there!